on March 23, 2014, 6:10 p.m.
on March 14, 2014, 5:46 p.m.
on Feb. 23, 2014, 9:26 a.m. 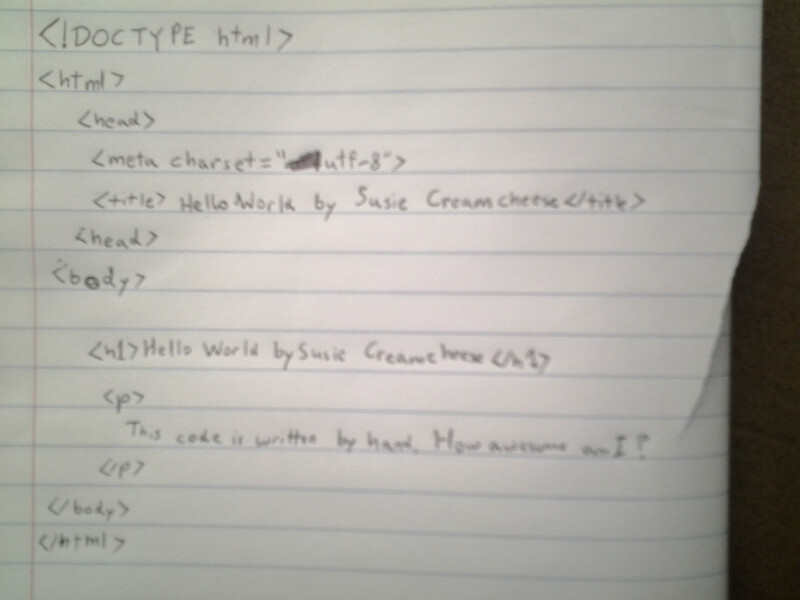 Here is my written html from memory. on Feb. 13, 2014, 12:53 a.m.
on Feb. 5, 2014, 5:24 p.m.
on Feb. 5, 2014, 4:24 p.m.
My handwritten HTML.Apologies for the poor hand writing. on Jan. 24, 2014, 11:16 a.m.
on Dec. 20, 2013, 6:32 p.m.
on Dec. 18, 2013, 6:24 p.m.
on Dec. 18, 2013, 6:22 p.m.
on Dec. 15, 2013, 3:02 p.m.
on Dec. 13, 2013, 3:28 p.m.
on Dec. 4, 2013, 3:33 p.m. Here's my first hand written htmel document. on Dec. 3, 2013, 5:44 p.m.
on Nov. 19, 2013, 7:01 a.m.
on Nov. 15, 2013, 2:08 p.m.
on Nov. 13, 2013, 11:26 a.m. I have written the code by hand until I memorized it perfectly. on Nov. 4, 2013, 11:04 a.m.